The Beehive is a four storey former riverside public house, now converted into apartment. It is possibly constructed on the site of an earlier public house. The �Robin Hood was a riverside public house and possibly also an hotel, now demolished. The building had a verandah and riverside terraces. Part of the gardens survive as the delightful Robin Hood Community Garden. The Anchor and Hope is an early twentieth century building, possibly on the site of an earlier building. 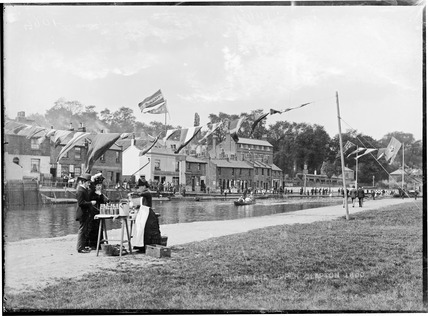 The three public houses were the focus of a thriving riverside leisure resort at the end of the nineteenth century, with rowing boats and boaters.�The area was described as 'The Henley of the Lea'. The cluster of activity may have originally grown up around the High Hill Ferry, which continued operating into the late nineteenth century. Repetitive river flooding led to the clearance of many residential properties on hygiene grounds, leaving the remaining buildings as isolated fragments of a once coherent riverside enclave. There are references the gardens of z riverside inns called the Mount Pleasant at High Hill ferry in 1838. Clapton riverside c.1870 showing the former Beehive PH prior to redevelopment in c.1880. The Robin Hood PH can be seen to the right. (Museum of London).